Phoenix, AZ, July 23, 2018 – Universal Background Screening has been recognized by Workforce Magazine among its “Hot List” of Background Check Providers, marking the ninth consecutive year that the publication has included Universal in their annual list. 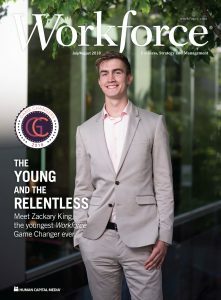 Workforce Magazine covers the intersection of people management and business strategy, helping HR professionals approach their jobs from a more strategic, big-picture, business-results perspective. The publication’s Hot Lists feature top providers of products and services for the human resources industry. Universal Background Screening offers businesses certainty in the employment process through a comprehensive solution including background checks, drug testing, physical exams and compliance management solutions that are fully integrated with dozens of leading applicant tracking and HR software solutions. “We are honored to be recognized by the editors of Workforce Magazine for the 9th consecutive year in their Hot List of the top background check providers,” said Kevin Olson, Chairman and CEO of Universal Background Screening. Universal is consistently ranked and recognized as one of the top screening firms in the United States. The company is a founding member of the National Association of Professional Background Screeners (NAPBS®) and was among the first handful of Screening Providers to be accredited by the Association’s rigorous onsite audit of policies and procedures across six critical areas: Consumer protection, legal compliance, Client education, product standards, service standards, and general business practices.